Much of contemporary art production in the last ten years has engaged in some form of sincere (that is, un-ironic) return to territories previously inhabited by those high-modernist disciples of abstraction from the mid-twentieth century. 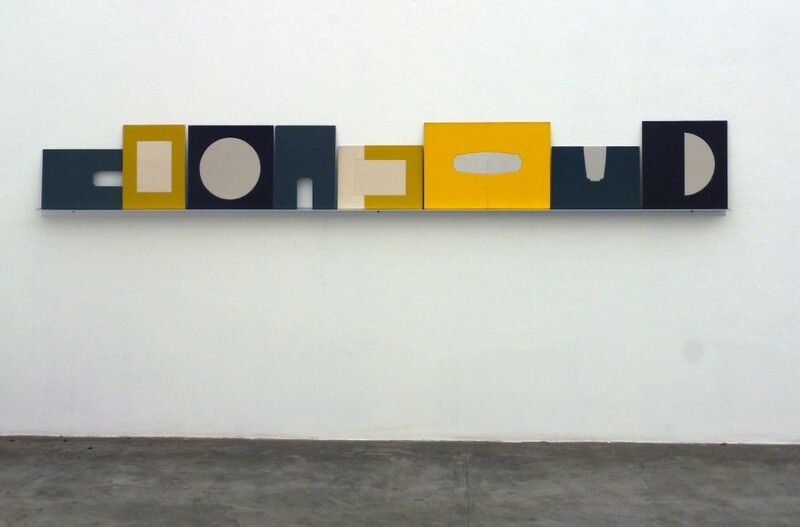 It is not surprising that in Brazil such revisiting would hover around the legacy of its Concrete and Neo-Concrete movements, both of which were interwoven with the country’s wider modernist revolution of the 1950s-1960s and instrumental in the conceptual trajectories of early contemporary artists such as Hélio Oiticica and Lygia Clark. Odires Mlászho’s current exhibition at Galeria Vermelho, “Arquibabas: Babas Geométricas,” resonates with this legacy in his investigation of “pure” shapes and concise graphic utterances. Yet these formal constructions quickly reveal themselves to be far more than a rehashing of this heritage, and instead an obsessive experiment in repurposing found objects and patterns. The bulk of this exhibition is comprised of the series “Arquibabas”—sequences of basic shapes repeated in different permutations and grouped together almost as though they were storyboard frames. The artist himself likens them to poems, echoing the spatial syntax of concrete poetry. The Portuguese word “baba” in the show’s title references “drivel,” “slobber” or “babble,” and indeed any emerging sense of language or code in each visual sequence falls short of any message, suggesting instead affective grunts or squawks. Ideas of reading and writing are echoed further by the substrate of these abstractions, which are plain, textured book covers, the type that were ubiquitously used in encyclopedia sets and other didactic serials for decades. Mlászho cuts into the covers using standard die-cutter shapes, mining different layers of the underlying materials, and emphasizing their worn physicality over the idealized space of earlier Concrete artists. 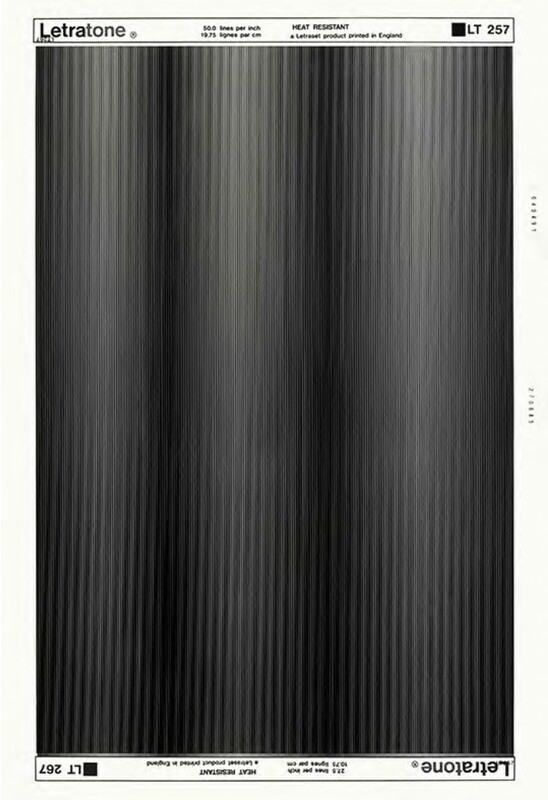 In a separate series, “Campo Sfumato,” the artist has scanned and reproduced in large scale various Letratone patterns common in pre-digital graphic-design studios. There is no discernible trace of alteration, rather, the shift in scale transforms the bold graphics into ethereal, foggy planes of texture. The deep tones of these prints exaggerate the reflectiveness of the glass they sit behind, creating an additional layer of optical hallucination. Rather than a detached exploration of concrete forms, Mlászho’s appropriations and material interventions read as an almost ethnographic study of obsolete patterns and objects which, with their services no longer needed, are opened up to subtly expressive reconfigurations. His found forms become both deconstructed and elevated by this process and, as hard-lined as most of these works are, the exhibition as a whole takes on an nearly elegiac tone toward its obsolete source material. Jordan Martins is a Chicago-based visual artist, curator, educator and musician. He received his MFA in visual arts from the Universidade Federal da Bahia in Salvador, Brazil in 2007 and has been an instructor at North Park University since 2008. He is the director of Comfort Station, a multi-disciplinary art space in Chicago with a wide variety of programs, and collaborates on programming with the Salvador-based Projeto Ativa. Martins’s visual work is based in collage processes, including mixed-media two-dimensional work, photography, video and installation. His recent work is primarily concerned with visual codes, camouflage and gestalt theory. As a musician, Martins collaborates with Angela James and Quarter Mile Thunder, in addition to improvised performances with musicians from varied backgrounds. He directed the Relax Attack Jazz Series from 2011-2013, serves on the programming committee for the Chicago Jazz Festival, and curates visual art at Elastic Arts.